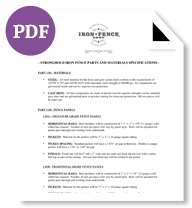 Learn more about iron and aluminum fence than you ever thought possible! Use our Knowledge Center resources below to research specs, CAD profiles, installation procedures or answer questions with our FAQs and About. You can also read some of our many testimonials, watch our helpful videos or view more pictures of installed fences and gates for project inspiration. 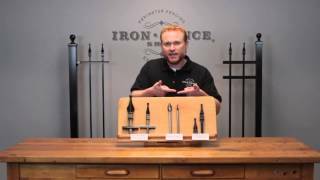 Should you buy iron or aluminum fence for your project and what is the difference? You can certainly use our experience as a testimonial as far as we’re concerned; your service was always quick, helpful and friendly. The youtube videos and the printed info was all helpful, and the product itself is really pretty splendid. The installers liked working with it, and it only took the two of them about a day and a half to do the whole job; they are, admittedly, very hard workers! The house (built in 1888) is right on the campus so that lots of people see it every day, and there has been nothing but enthusiastic praise, and lots of it, for the impact the fence has had on College Avenue. I’m so glad there is a place like yours that provides a product that can be confidently used to help restore historic neighborhoods in this way. 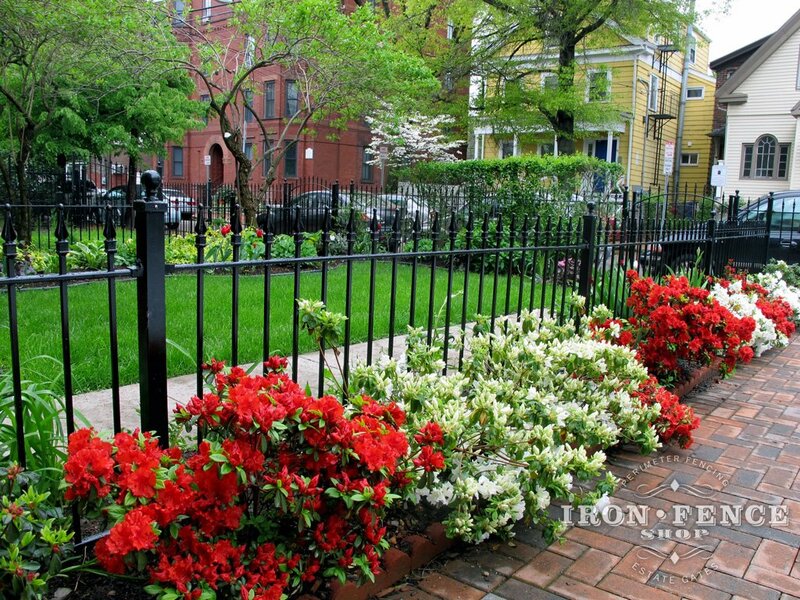 What iron fence heights do you offer? 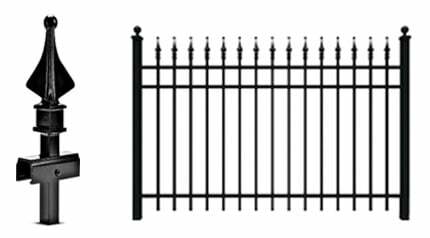 Our Pool style Stronghold Iron fence panels are 8ft (96in) wide and available only in a 50" height to meet pool code. 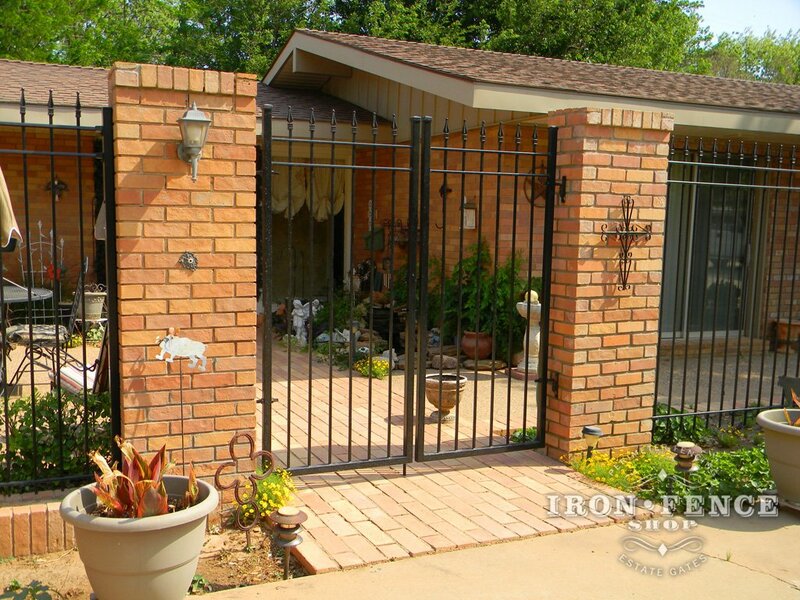 Do you offer iron gates that match the fence? 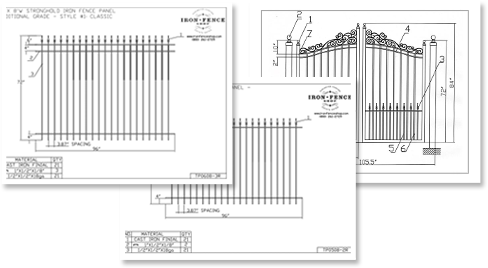 Our Pool style of iron fence offers a more limited selection of gates sizes coming only in a 4ft wide single and 8ft wide double gate configuration. Yes you can and roughly 90% of our customers do! It will also help cut your project cost roughly in half by not paying a contractor to do it. You will likely do a much better job as its your home and you can spread the project out whereas a contractor is looking to get your fence or gate up as quickly as possible and move onto the next job. The majority of the photos in our Knowledge Center Photo Gallery are from customers that installed it themselves. Installation requires only basic hand tools as everything is modular. For more detailed install guidelines, visit the Installation page in our Knowledge Center. How soon will I receive my materials after ordering? Lead time varies depending on time of year, but it is usually 2-10 business days to be picked, packed and shipped from the warehouse. Once an order leaves our warehouse, it’s typically a week or less for delivery depending on where you live. 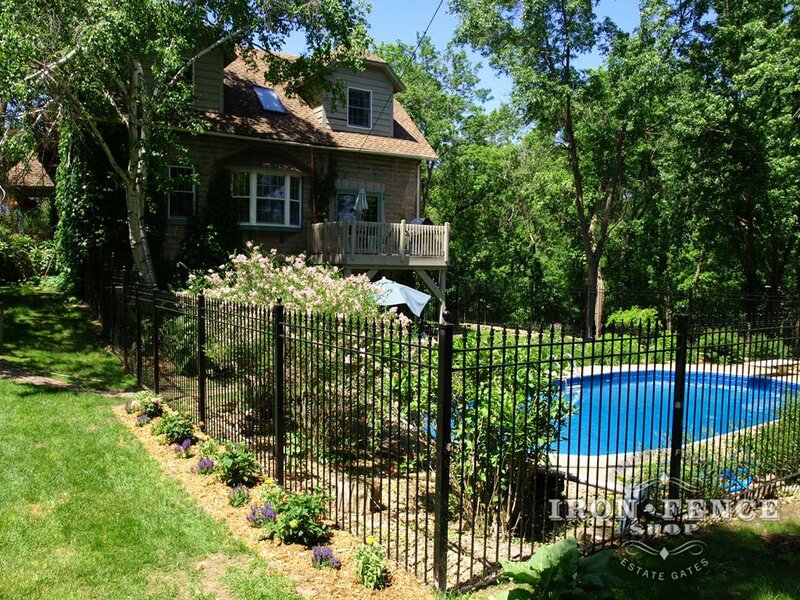 How is your iron fence better than others I can find online or locally? Our Stronghold Iron stock is hot-dipped galvanized. 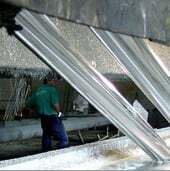 This means that you have rust protection inside and out on our iron pieces whereas our competitors typically only primer the outside with a thin e-coat. All constructed panels, posts and gates receive a 4-stage pre-treatment and wash to rid them of impurities before applying a polyester TGIC powder coat finish. 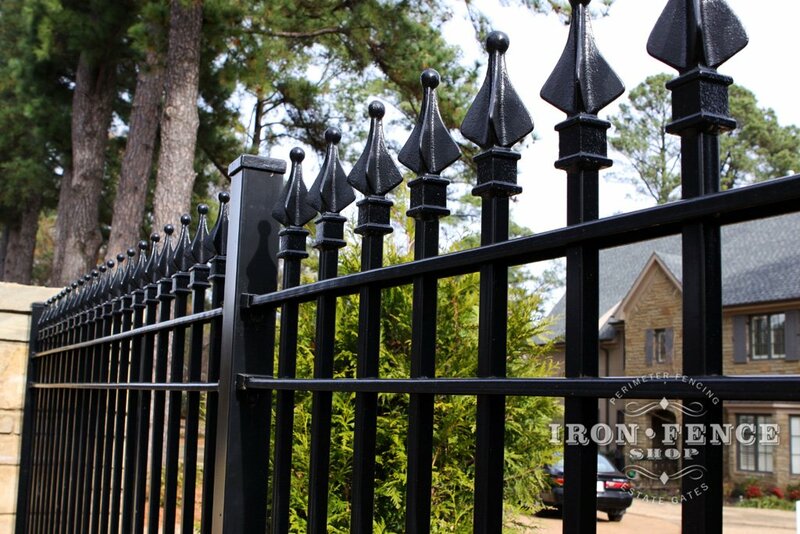 All of our fences and gates come with iron finial tips welded on standard. 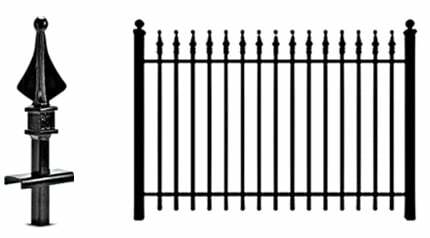 Our competitors either utilize an ugly pinch top picket or charge extra for what is essentially the most iconic element of an iron fence. When you add on the optional cost of finial tips to our competitor’s fence, they actual cost much more than ours and give you lesser quality components! 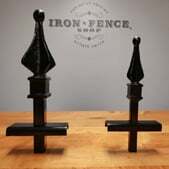 Our finial tips are true cast-iron pieces that are welded to the fence or gate picket. Our competitor’s add-on finials are made of either thin aluminum or worse, plastic, and pressed on whereas ours are welded on. Our Infinity Aluminum line includes welded on, solid aluminum finials. We are the only company in the industry offerings this! Our competitors either utilize an ugly pinch-top picket or charge extra for adding optional press-on finial tips to their fence. 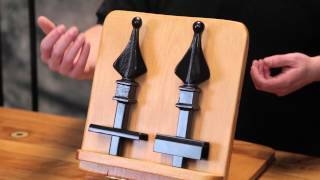 When you add it up, they actual cost much more than ours with welded on finials included! 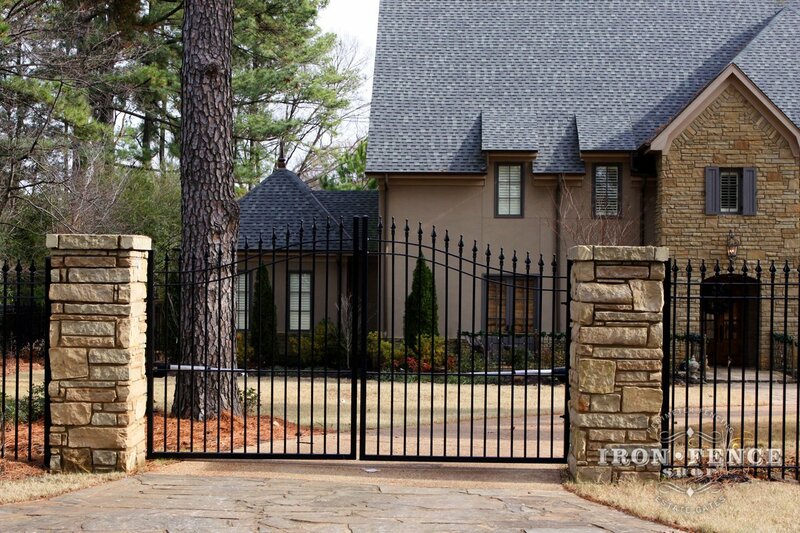 Both our Stronghold Iron and Infinity Aluminum driveway gates include welded on finials at no extra charge. Our competitors either utilize an ugly pinch top picket or charge extra for adding optional press-on finial tips to their gates. When you add it up, they actual cost much more than ours with welded on finials included! 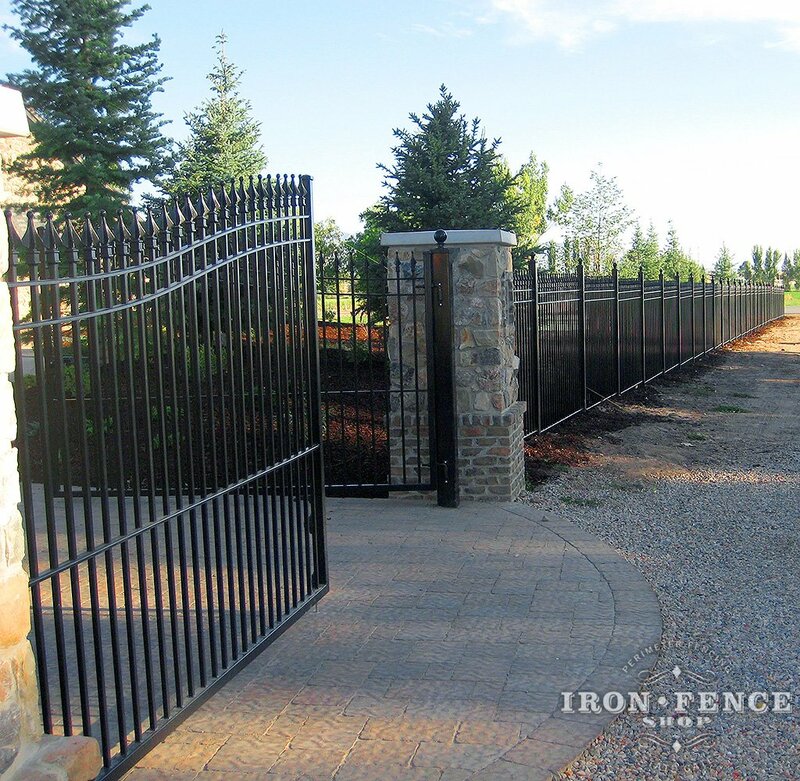 All our Stronghold Iron and Infinity Aluminum driveway gates include an additional horizontal rail about 2ft up from the bottom frame that can act as an operator bar for any automated gate opener setup. 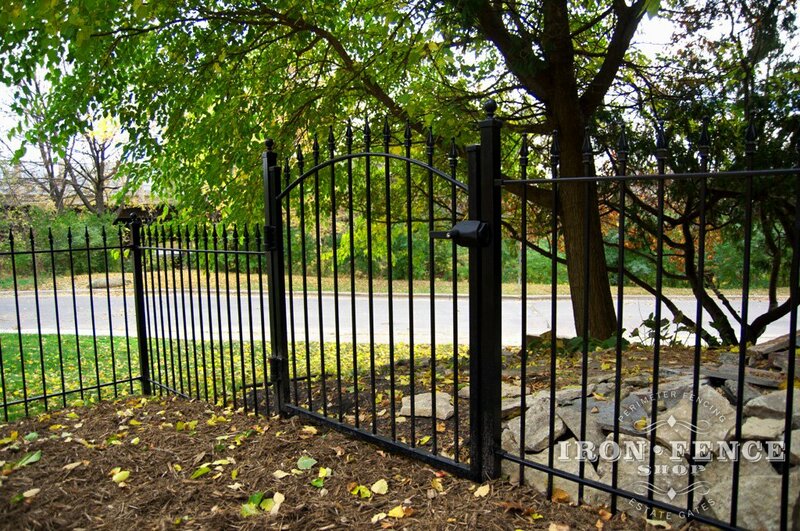 Why choose iron over other types of fence and gates? 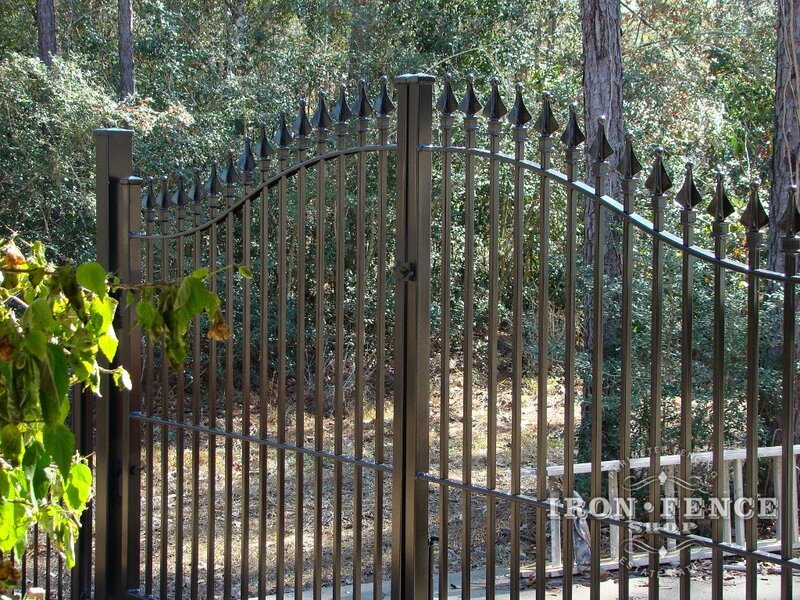 It’s no coincidence that many historical and high-end properties have wrought iron fences or gates. 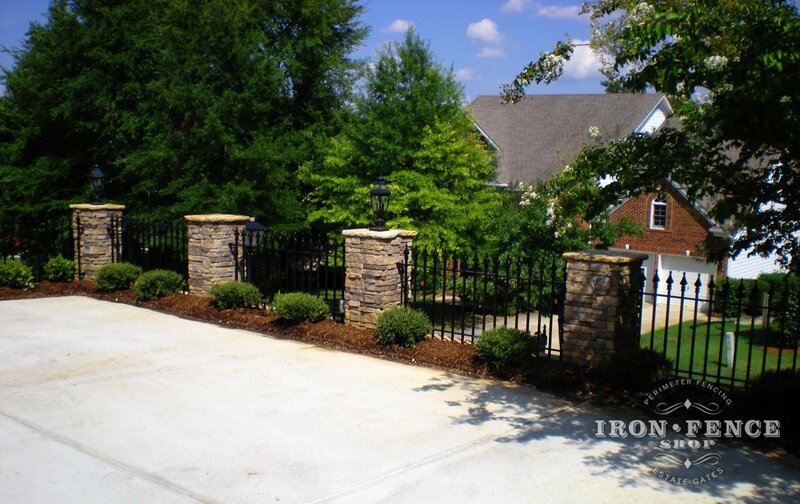 The timeless beauty and strength of wrought iron makes it a winning choice on both fronts. For strength, security and longevity, there is no better fence than iron. In regards to strength, iron is going to take much more abuse than other fence materials before bending or breaking. 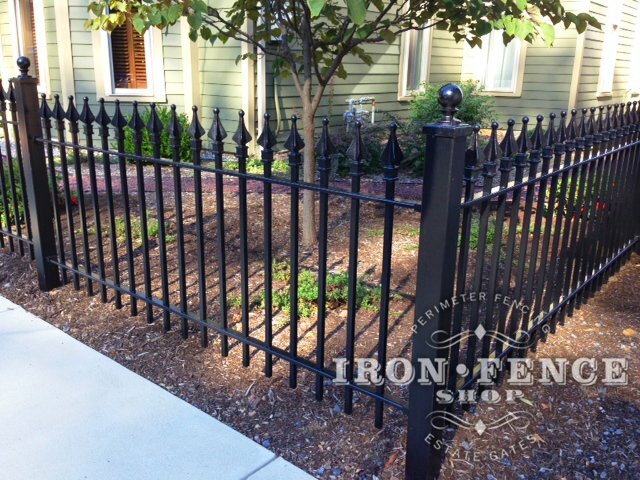 An iron fence will also outlast anything made of wood, vinyl or composite. 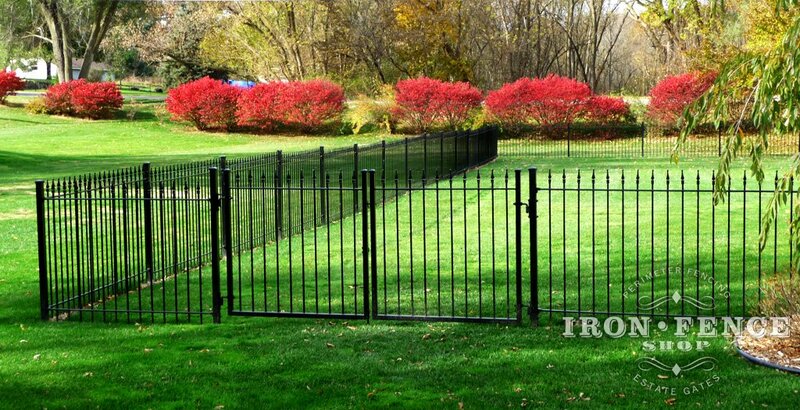 Why choose aluminum over other types of fence and gates? The main benefits of an aluminum fence or gate are that they are lightweight, durable and virtually maintenance free. Unlike steel and iron that can rust if its protective powder coat is compromised, aluminum will not corrode further when exposed. What is the difference between your ‘Traditional’ and ‘Signature’ grade products? We offer our Stronghold Iron and Infinity Aluminum products in two grades to provide options on profile and strength within each style. 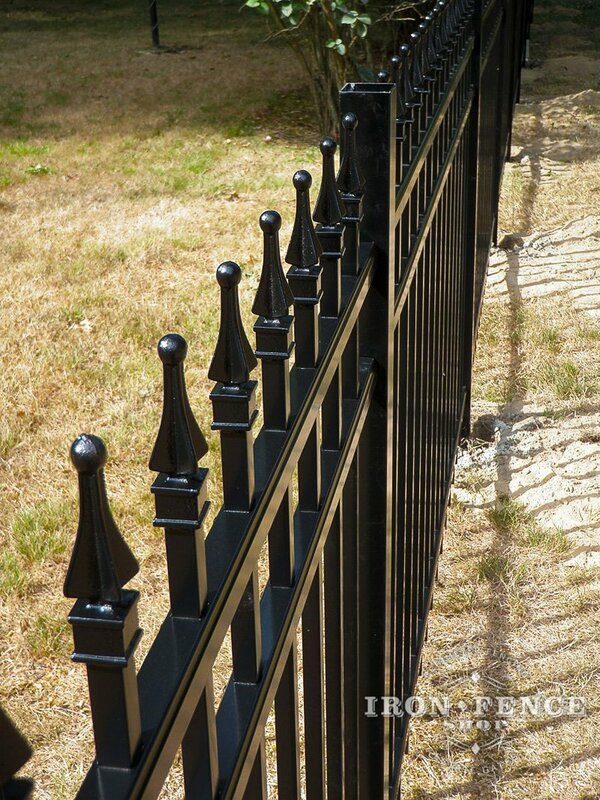 Traditional (standard-duty) grade is the smaller of both profiles with a 1/2” (iron) or 5/8” (aluminum) picket with a 4in tall finial tip on top. Our Traditional grade profile more closely represents pieces made 100 years ago with its smaller features. In terms of appearance, we recommend the Traditional grade when you want the fence or gate to blend in as part of the landscaping and not be a main focal point. Our Signature (heavy-duty) grade is the larger of both profiles with a ¾” square picket and 6in tall finial tip on top for both Stronghold Iron and Infinity Aluminum. Our Signature grade is the more heavy-duty option as its larger profile and thicker components are stronger than its Traditional grade counterpart. In terms of appearance, we recommend the Signature grade when you want the product to stand out as a main element in your landscape. Do I need Traditional or Signature grade products for my project? There is no set rule on which grade to utilize. Discuss where you will be installing the fence or gate with your Iron Fence Shop Sales salesperson and they can help suggest which grade would work best for you. 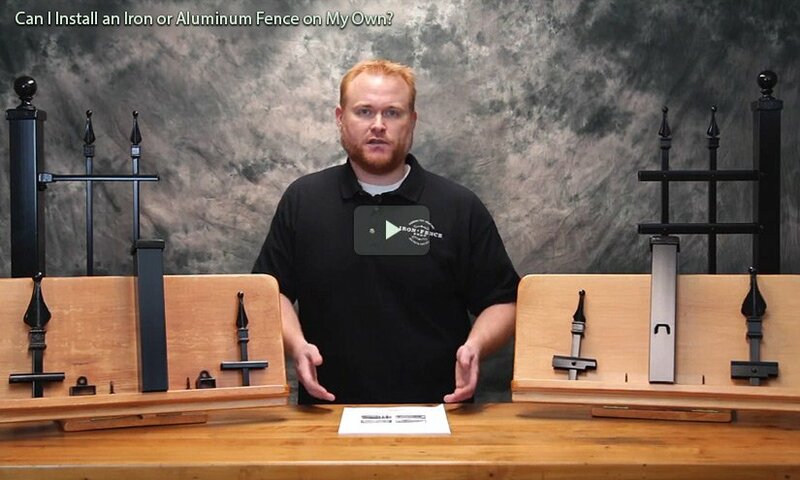 Can I Install an Iron or Aluminum Fence on My Own? 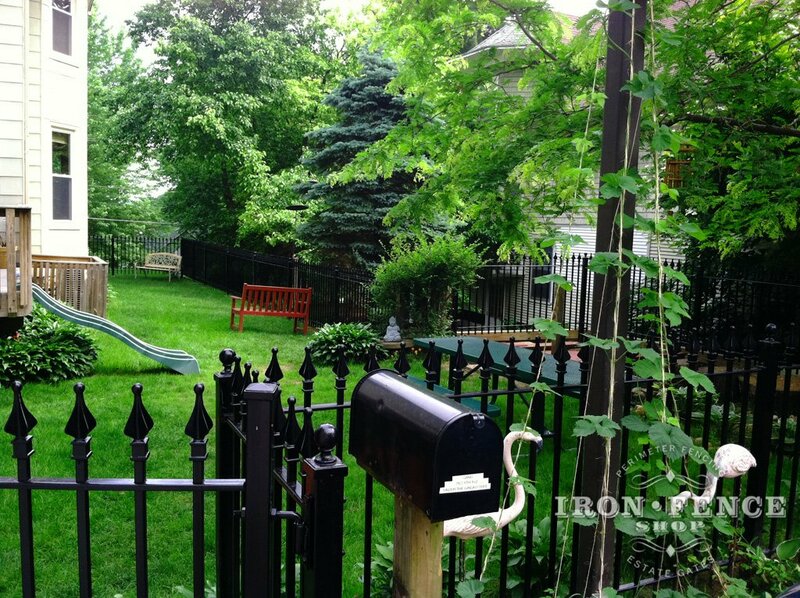 What is ‘Traditional Grade’ and ‘Signature Grade’ Iron and Aluminum Fence?